Cough, spit bubble and cockadoedeldoe. Julia Randall makes amazing pencil drawings, so well that it looks just like a photo (expect the composition then). When I say this I was in love with the makeup compact with tongue and mirror. Lick that foundation clean. The vision was so above any I’ve seen and I love the usage of tongue. 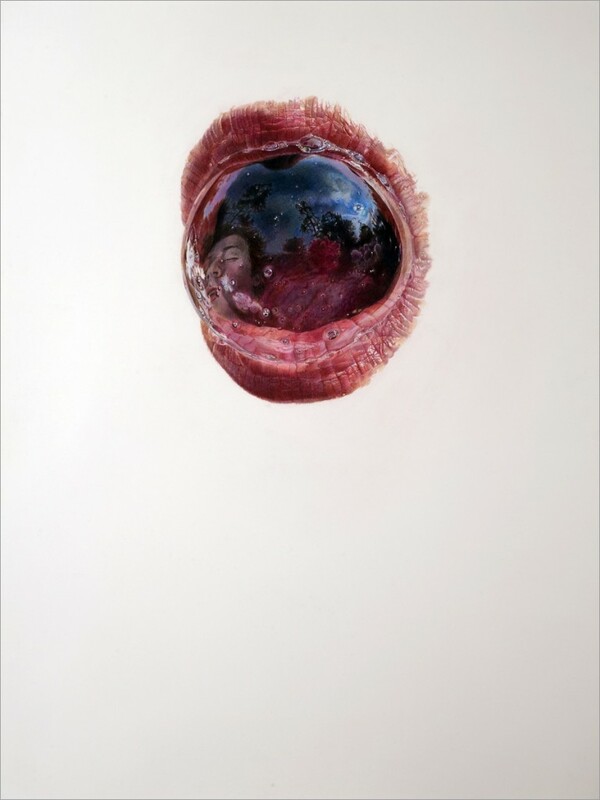 It creates a somewhat sexual tint but also vulgarish with spit and saliva. 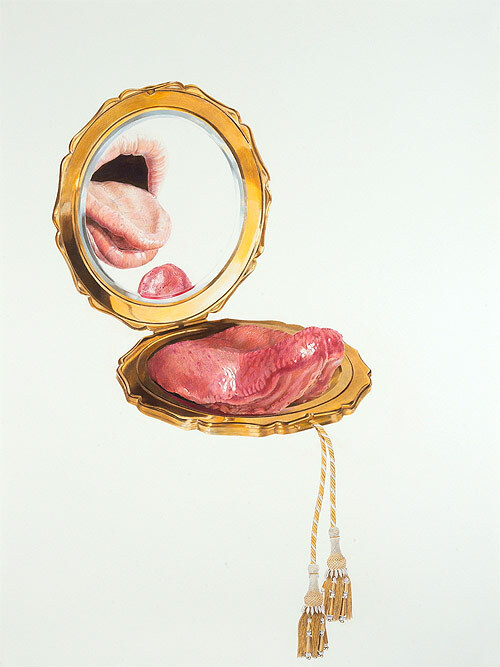 Julia Randall creates a hyperrealistic feeling by showing so much detail. The cells and molecules on the tongue all individually catch the light and make in that much more 3-D-ish. 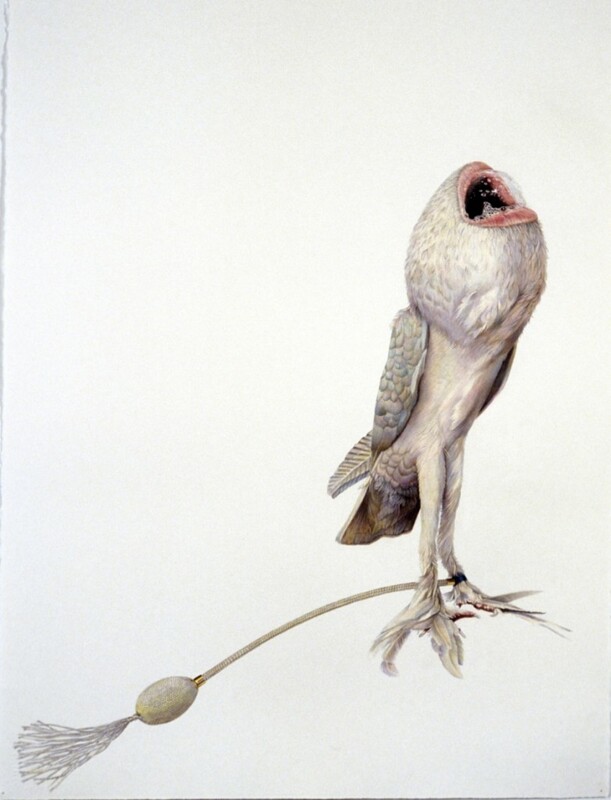 Next to tongue focused objects, Julia Randall also combines the mouth on bird bodies which make me wonder what the sound effect would be of a bird making human twitter-twatter sounds. The above bird’s body is also made in such extreme though that the head fits perfectly with the mouth. Attached to its leg its seems to symbolize a pump like a old-school perfume. Wonder what that bird/human mouth smells like. L’eau du feather fart. I know I’d want some. Randall, Julia. Compact. 2004. 7-2-2014. <http://www.julia-randall.com/compact.html&gt;. Randall, Julia. Lick Line #30. 2005. 7-2-2014. <http://www.julia-randall.com/lickline30.html&gt;. Randall, Julia. Lovebird #5. 2005. 7-2-2014. <http://www.julia-randall.com/lovebird5.html&gt;.